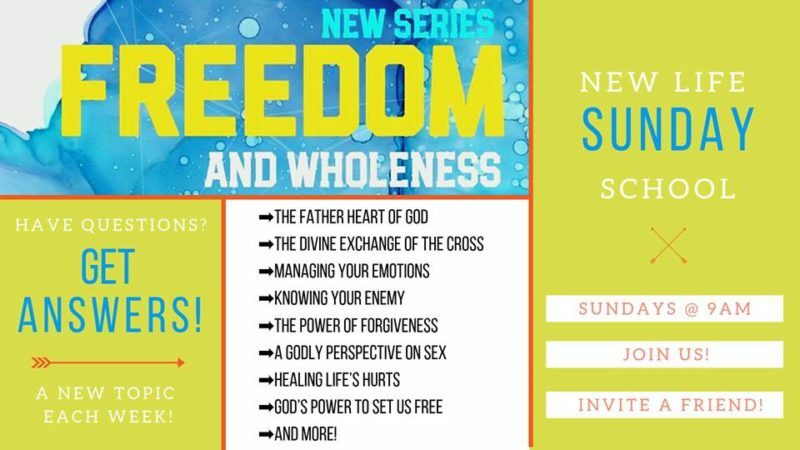 NLCF is starting a new series: Freedom and Wholeness. Discipleship Class meets each Wednesday from 6:00 – 7:30 p.m. in the Lower Level. We will watch DVD teachings by Dr. Grant Mullen, a Christian mental health physician known for his ability to shed light on destructive behavior and thought patterns and to help people walk into emotional healing and wholeness. This series on living a transformed life is well worth your time! For more information, contact the church office at (989) 354-0095, or visit www.newlifealpena.org. February 20 Shame our Hidden Torment: how shame damages relationships and the behaviors we use to hide our shame. March 6 Overcoming Rejection: how to recognize and be healed of the wounds of rejection. March 13 Moods: what we should know about depression, anxiety and mood swings. March 20 Anger Part 1: learn how to take control of your anger so it no longer disrupts your life and the life of those around you. March 27 Anger Part 2: learn how to take control of your anger so it no longer disrupts your life and those around you. April 3 Controlling Relationships: learn to recognize when your life is being controlled by relationships from the past or present and what to do about it. April 10 Freedom from Co-Dependency: how to recognize and recover from it. April 17 The Power of Words: ours and others.